"Staunton is a thrilling actor to observe"
"everything slots perfectly into place"
"Chichester has another hit on its hands"
Imelda Staunton stars in Gypsy, the legendary Sondheim musical widely considered to be the best show in Broadway history. This acclaimed production transfers from the Chichester Festival Theatre to the West End. The story revolves around the ambitious Momma Rose and her efforts to put her two daughters June and Louise on stage in a vaudeville act. June dramatically quits the show, so Momma Rose must coax her shyer daughter Louise out from her sister’s shadow and into the limelight. But the times are changing. Audiences no longer want the family fun of a vaudeville act; they’re craving the exoticism of burlesque acts. Those who don’t keep up with the big performers will be forgotten, so will Momma Rose manage to turn her daughter into a burlesque star? The show is loosely based on the life of Gypsy Rose Lee, the famous American strip tease performer, and includes songs such as ‘Let Me Entertain You’, ‘Rose’s Turn’ and ‘Everything’s Coming Up Roses'. Fabulous . Didn’t realise how vast Imelda’s talent was, I do now!! 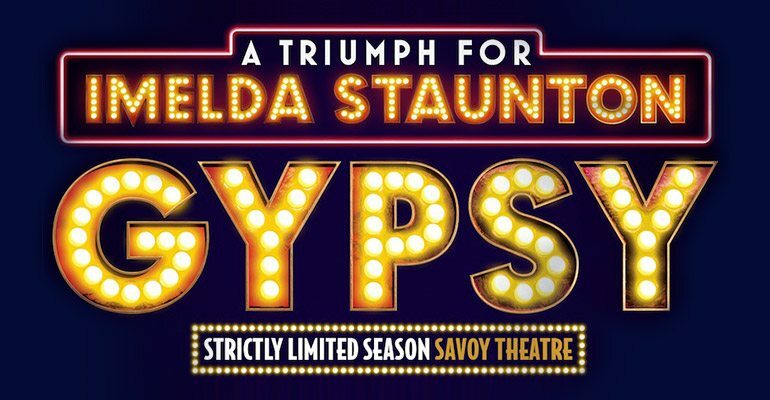 I saw Gypsy live in June 2015 after loving the original film &amp; Imelda Staunton was fantastic as Momma Rose. Full Marks also go to Lara Pulver and the ladies who played Tesse Tura, Mezzepa &amp; Electra! Saw the television programme on Sunday, 27th December 2015. Brilliant show and Imelda Staunton was absolutely superb. She had me in tears at the end. What a brilliant actress and, as it turns out, a magnificent singer. She should win plenty of awards for this performance. What a star!! Just watched the production on BBC 4 It was wonderful would not have missed it for the world Great, keep it going . This is a stunning production Imelda Staunton is absolutely stunning! The whole cast make for a wonderful production. One of the best musicals I have seen in a long time. Thank you to the whole cast! Went to see last night. Imelda was superb. Was singing along when I knew the song! Would recommend to anyone if they are not sure what to see. Gypsy - cast were wonderful, musicians amazing, Lara Pulver fabulous. Imelda Staunton? Beyond words... Absolutely a must see! A superlative production all round! I just wanted to say on seeing the afternoon Saturday performance on Saturday 22nd August 2015 of Gypsy how fabulous the show was throughout. All of the cast were magnificent. Imelda Staunton gave a stunning and so moving performance. What a superb show! It has everything! Great songs and dance, boundless energy, passion, comedy and pain. Some excellent performances and Imelda Staunton is just breathtaking! A great night certainly and with just a little emotional challenge to add spice. As the cast took their bows the entire audience stood as one body. This show is amazing. It works so well on every level. Imelda Staunton gives a heart-wrenching, show-stopping performance as Mama Rose. That said, the rest of the cast are faultless - specific praise to the solo dance by the actor who plays Tulsa. The show is a joy from beginning to end and I can honestly say this is one of my top 3 shows from the past 25 years. Would love to see again but it would be criminal to deny another person the chance to see this brilliant show. Definitely "kill for a ticket" to see Gypsy. Fantastic. Imelda Staunton is brilliant. Brought a tear to my eye in "Rose's Turn." She received a well deserved standing ovation.